Restaurante El Gaitero is a traditional restaurant offering Spanish cuisine. The average price of a main course dish at the Restaurante El Gaitero restaurant is 15 euros. The average price of a 3-course meal at the Restaurante El Gaitero restaurant is 35 euros. Note that although GoMadrid.com strives to maintain all information about Restaurante El Gaitero up to date, the prices mentioned are only an indication and may not reflect the exact value of your meal. Family restaurant located right in the centre of Madrid near Plaza de España and offering dishes from the Asturias region of Spain. Grilled fish and meat dishes are available, together with such Asturian specialities as octopus and 'fabada', a delicious stew made from butter beans. Spanish cider is also on offer. 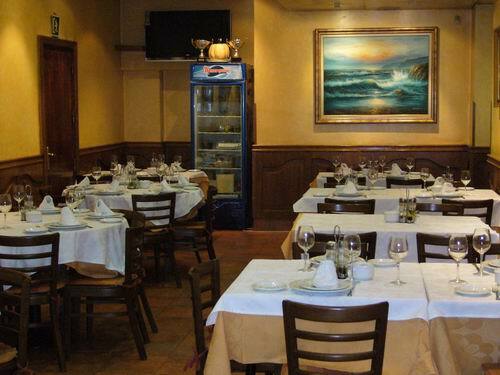 The address of the Restaurante El Gaitero restaurant is: Calle Alamo 3, 28015 Madrid. The nearest Metro station is Plaza de España. Please see the Restaurante El Gaitero restaurant location map below.